This dessert used to make my mum for christmas. I can taste chocolate in it by just looking at the old pictures of our family sitting at the christmas table. But there is a slight change to my recipe which I prepared just few days ago. I used a touch of the best quality almond liquor Disaronno and only the best ingredients such as chocolate with 87% cocoa content, full fat organic butter and also free range eggs. There are different options for making this dessert. Now you can try my version too. Let´s get onto it! Meanwhile, place the butter in a bowl at room temperature and tear down in pieces and add the sugar using electric whips. Pour in Disaronno. Pour the beaten eggs into the mixture and continue to whisk with electric whips until a light and fluffy mixture is obtained. At this point pour the melted chocolate in. Keep stirring until the chocolate is well incorporated . Now take the biscuits and chop them coarsely with your hands in a bowl, add them to the chocolate mixture. Transfer the dough onto a sheet of baking paper, spread the dough with the spatula and create salami shape. Lift one of the two ends of the sheet, bring it to the center and roll the salami until it is completely wrapped with baking paper. Fold the two side paper flaps so that the salami is firmly closed. Place the salami on a tray and and leave it in the fridge to harden for at least 3 hours. 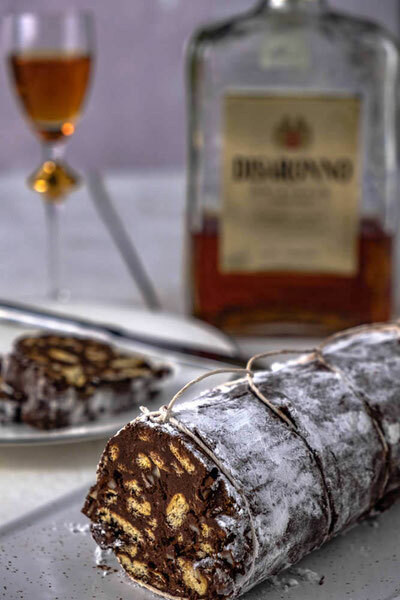 Once the chocolate salami has firmed, you can tie it with string and sprinkle it with icing sugar. Serve with chilled glass of Disaronno!